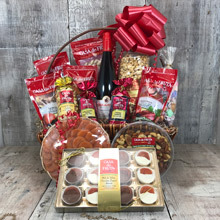 A Royal Collection of wine and gourmet goodies that will impress any gift recipient! Extra Fancy Apricots Tray 16 oz. Chili Lemon Peanuts 8 oz. Net Wt. 125.5 oz. plus Wine. Ship Wt. 20 lb. NOTE: SHIPPING RESTRICTIONS APPLY. LIKE MOST FAMILY WINERIES, OUR PERMIT ONLY ALLOWS US TO SELL WINE TO AK, CA, FL (EXCLUDING LAFAYETTE, LIBERTY AND WASHINGTON COUNTIES), MN & DC. WINES MAY BE DELIVERED ONLY TO PERSONS WHO ARE AT LEAST 21 YEARS OLD. NOTE: SHIPPING RESTRICTIONS APPLY: DURING WARM WEATHER CHOCOLATE, TAFFY, AND GUMMI PRODUCTS CAN BE SHIPPED MON/ TUES/ WED, OVERNIGHT OR 2-DAY AIR ONLY on chocolate products starting May 1st through September 30th. Occasionally, weather can be unpredictable. If the weather in delivery area is above 80 degrees during any month of the year we suggest the package be expedited.